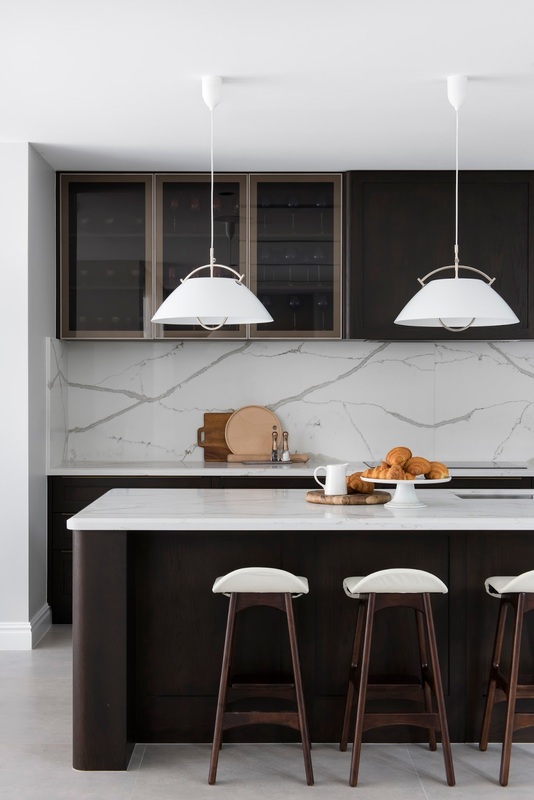 Clean lines and a simple material palette, along with classic lines and detail make this kitchen a instant classic, one that will age with a lot of grace. These clients came to us whilst constructing their family home, in the waterside Inner West suburb of Cabarita. Overwhelmed by the un-planned spaces, they approached us to improve the flow and functionality of the interiors. 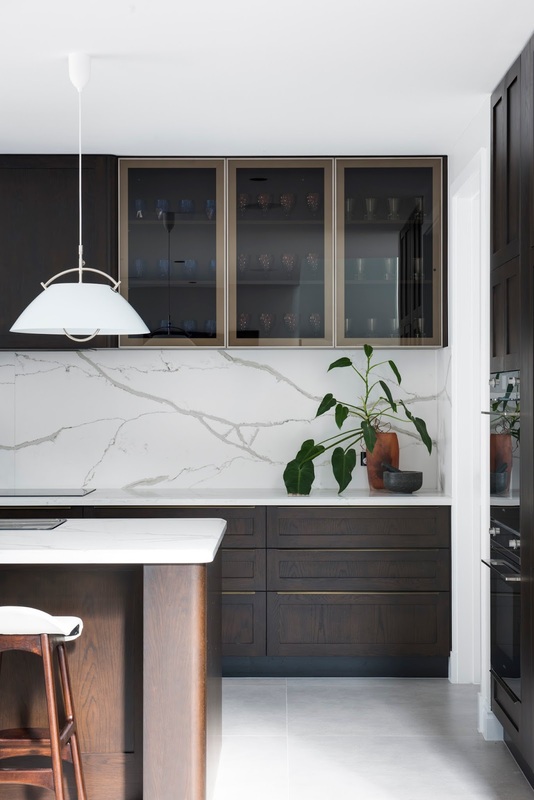 However, with opposing tastes, a husband wanting streamlined modern and a wife desiring classic elegance, this project was destined to be a challenge. 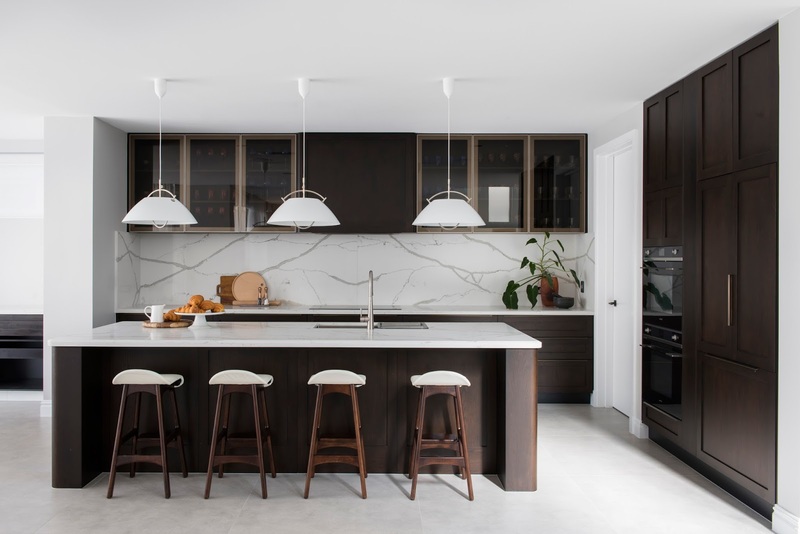 They were unanimous on one thing - the Kitchen was to be the ‘Heart of the Home’. An inviting space, connected with the dining, living & scullery areas. 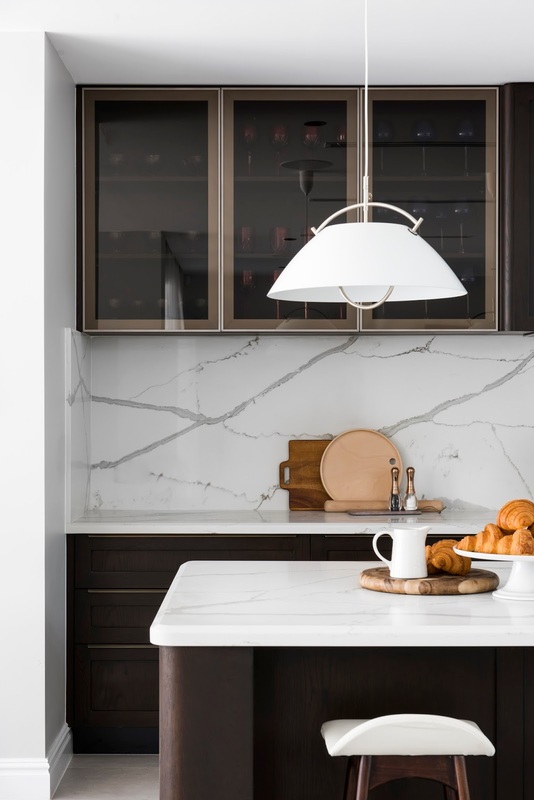 Quality was important, preferring natural materials, such as timber and marble, complimented with warm, soft lighting. The construction in progress formed an undertone of urgency and we were restricted by the location of new walls and windows. 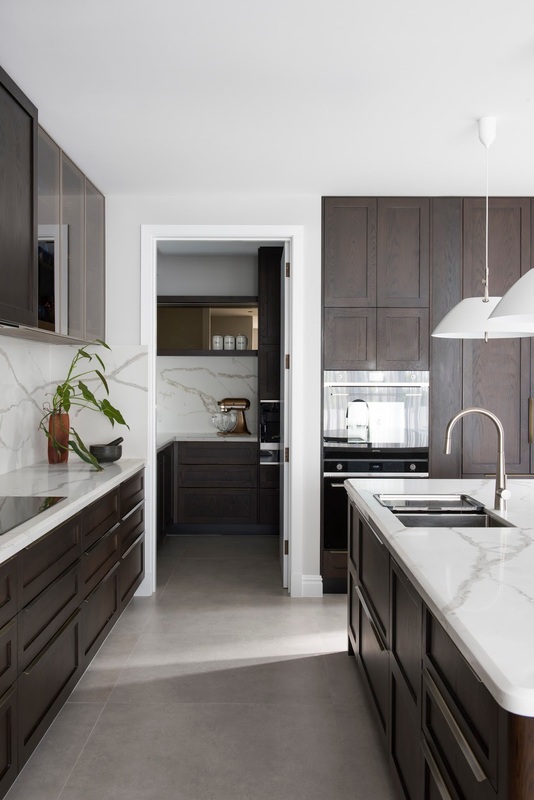 Additionally, we were requested to refine another cabinetmakers highly traditional Kitchen design, which was overloaded with cupboards – a great challenge, as storage was paramount for this client. The existing joinery design was heavy in timber panelling details, emphasized by varying widths of cabinets and adorned with chunky handles. The island unit was also bulky in its shape, with thick heavy benchtops. This seemed to close the Kitchen space in immensely. 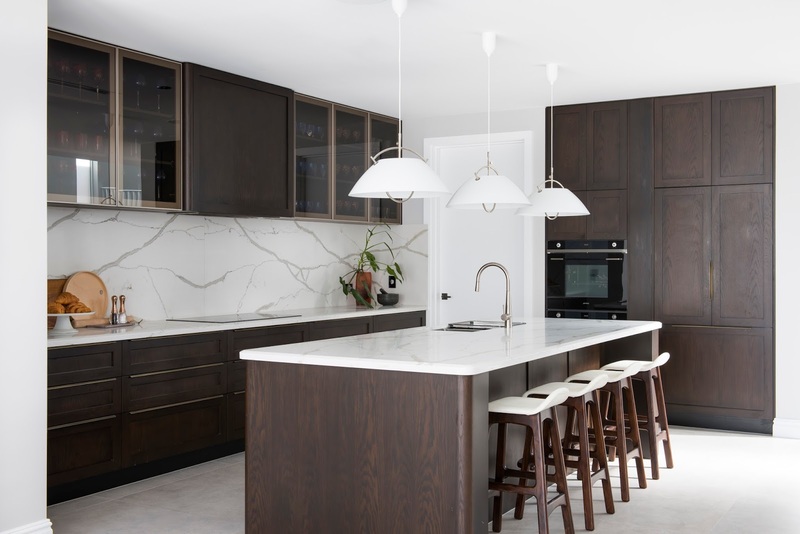 Especially as the adjoining Living Room was expansive, with double height ceilings, in comparison to the low ceilings of the Kitchen and Scullery. We needed to open this area up and balance it’s volume with the connecting spaces. We started with creating fewer but larger cabinets, using the full ceiling height. We added deeper drawers with hidden inner drawers and integrated most of the appliances. 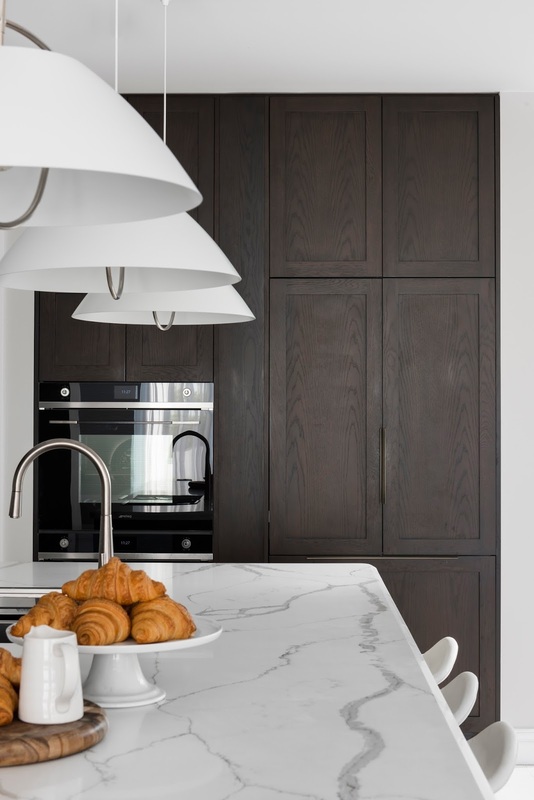 For continuity, the drawers and benchtop continue through to the Dining Area, functioning as a servery. 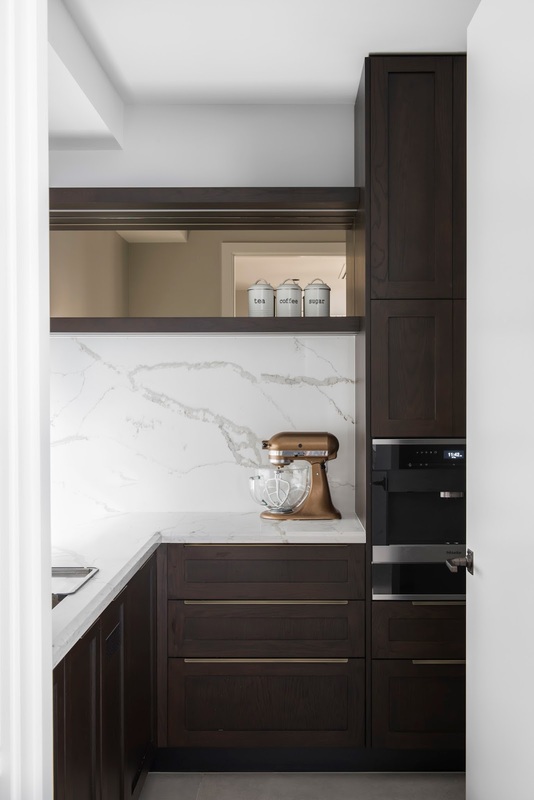 We created openness in the Scullery by using exposed shelves, with recessed LED lighting and placing the tall cabinets at the far end. 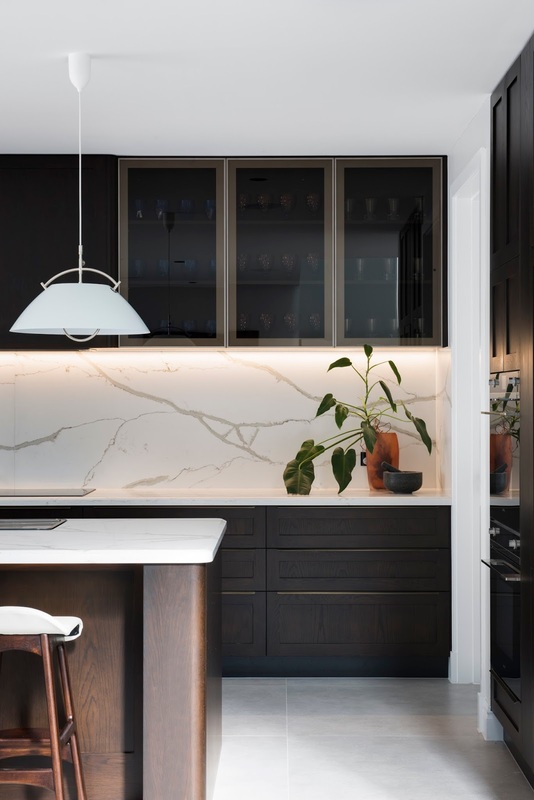 Then commenced the re-instating of elegant details, such as modern timber panelling, marble benchtops with bullnose edging and classic pendant lights. Instead of minimalist recessed handles, we used pull handles, although, long and thin. We used bronze glass on the overhead cabinet doors and integrated LED lighting internally, this added sophistication and created a sense of lightness. Overall, we detailed a layered lighting scheme, using few downlights and recessing LEDs into joinery to function as task lighting and under the island benchtop for ambience.